A spectacular vista along the Appalachian Trail in New York almost became a 50-unit subdivision, ruining one of the highlights of the A.T. in New York. 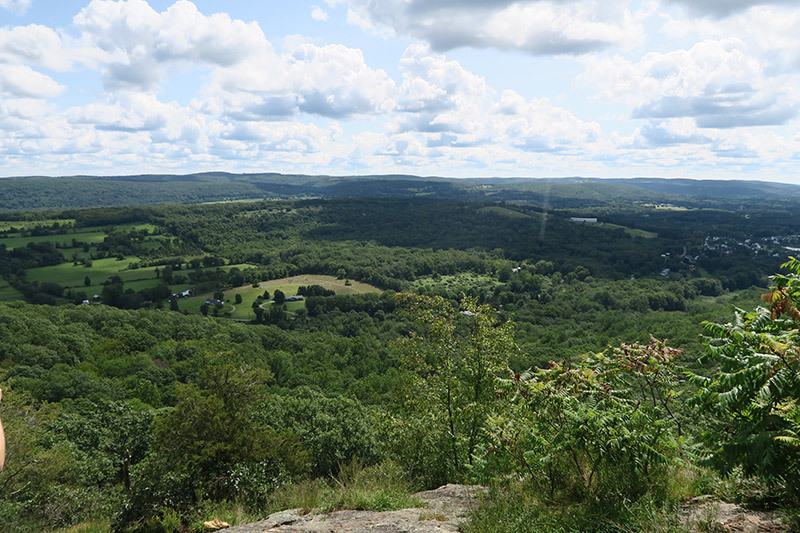 Instead, The Trust for Public Land in 2018 permanently protected 219-acres in Pawling, New York, in an effort to enhance and protect the A.T. and its surrounding landscapes. Corbin Hill's protection ensures that the picturesque views of the Harlem Valley are not interrupted by housing developments, that ecologically-sensitive habitats remain intact, and that this special place along the A.T. can be enjoyed by all. The Trust for Public Land has transferred the property to the National Park Service which will permanently protect and steward the land. The acquisition of this property was made possible through a partnership between The Trust for Public Land, National Park Service, the Appalachian Trail Conservancy, and the Oblong Land Conservancy, who for years worked tirelessly to permanently protect this land for people to enjoy. Funding for the land purchase came from the federal Land and Water Conservation Fund (LWCF), a program that uses offshore oil and gas lease revenues to protect America's open spaces. LWCF has been America's most successful conservation program for the last 50 years. Project costs were supported by the Appalachian Trail Conservancy, National Park Trust, Oblong Land Conservancy and numerous other individuals. While much of the A.T. is isolated, in some places it passes along and through towns and communities, offering hikers an opportunity to refuel and restock on their way north or south. At the same time, for those nearby communities the A.T. provides a significant close-to-home outdoor recreation opportunity that brings tremendous benefits for local residents and visitors alike. This is the case near Pawling, New York, where the A.T. is well used by the local community and New York City residents alike. One of the most accessible and visited portions of the Trail, this scenic part of the A.T. is accessible via commuter rail from New York City; hikers can take a weekend train from Grand Central Station in the morning, hike all day and then return by train in the afternoon. Corbin Hill is accessible from the only mass transit stop along the A.T. and it serves as a model for sustainable and equitable access to hiking for all. This section of the A.T. contains habitat for critical and endangered species, as well as the largest blazed tree on the A.T., a white oak named the Dover Oak. Protection of this land allows for the shifting of existing off-road parking, which is currently within the root system of this legendary tree, to another off-road site so the Dover Oak can thrive, as well as permanent protection for native wildlife. For more information about Corbin Hill, please see this video: https://vimeo.com/272609426. Stretching 2,190 miles from its southern terminus on Springer Mountain, Georgia, to its northern terminus on Mt. Katahdin, Maine—and hosting 3 million visitors per year—the A.T. is America's most iconic long-distance hiking trail. Its place in American history is firmly established and the A.T.'s historic footpath is fully protected. However, development and other pressures now threaten views, wildlife habitat, and the quality of the hiking experience. The A.T. was conceived of in 1921, created in 1937, and is now managed by volunteers under the authority of the National Park Service. Spanning 14 states and numerous ecological zones, the Trail is also one of the most biologically diverse units of the National Park system. Do you love public land in New York? You can help. Donate today.